Every city has its gems – those items they look to show off to visitors and the places they don’t like to show. As someone who regularly looks for graffiti, I’m used to people not wanting to reveal where these unique creations can be found. But some cities have things that make them infamous, even if no one really wants to own up to it. 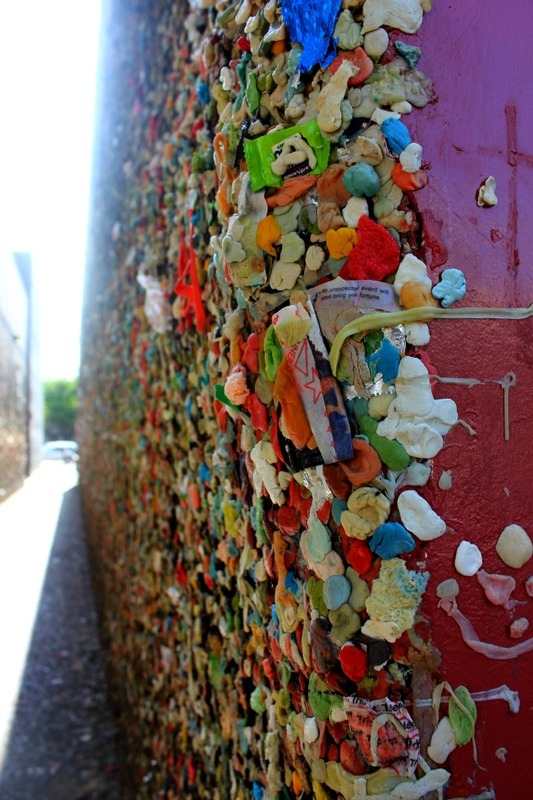 San Luis Obispo was proclaimed the Happiest City in America, and I wonder if they’re bubblegum alley contributes to it. Located in the downtown, the alley is a typical path from a parking area behind the main street buildings – but its walls are covered in bubble gum, deposited by locals and visitors, into a patchwork quilt of colours and textures. There was part of me that was fascinated, but there was also part of me that was disgusted that someone had taken something they had chewed and placed it on a public wall with pride. There was no shame in their participation in this creation. I didn’t want to walk through the alley, and took my photos standing at the street-side – happily far away from any contact with the walls of gum. But it made me wonder if others got pleasure from this ad-hoc creation – a wierd, pseudo art installation – and something that won’t be found on any tourist brochure, but certainly gets a visitor curious about this small California town.